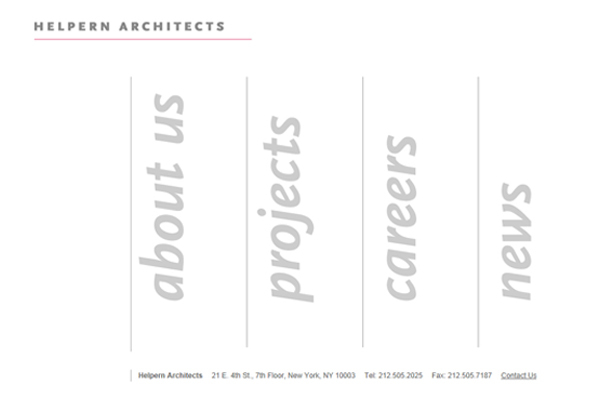 We’ve had the old website for many years, and it has served our informational purposes, but we are in the process of changing it to reflect Helpern Architects going forward. That much-visited, regularly-updated but nonetheless worn website doesn’t look like us any more. Post-recession, we’ve become a different company, doing our work with a lively group of professionals [including a number of very special new faces], using the latest technology. The main members of the in-house team that redesigned helpern.com are Nicholas Chelko and Marian Paredes Suarez, under the leadership of Principal and Vice President Bennet Dunkley. The text is largely from Capelin Communications. Whitehouse & Company was again involved in the website development. In the interactive spirit of the times, tell us what you think about the new website. Each time you return, we will have even more up to interest you.